Swan Lake is the first of the three great ballets that Tchaikovsky wrote, and arguably the most famous. The piece is mainly known in the shape it obtained in 1895, when it became a classic in the choreography of Marius Petipa and Lev Ivanov. That “imperial” version strayed from Tchaikovsky’s world premiere score, with several cuts, abridgments and displacements. This high definition recording presents the work as it was heard during the 1877 world premiere performance, highlighting the extraordinary symphonic qualities of Tchaikovksy’s original conception. 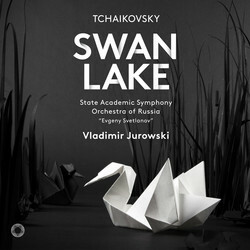 Swan Lake is performed by the State Academic Symphony Orchestra of Russia “Evgeny Svetlanov” led by its Artistic Director Vladimir Jurowski. Jurowski has recorded extensively for PENTATONE and has received enthusiastic critical acclaim. In July 2017, he signed a long-term, multialbum agreement with PENTATONE including a new complete cycle of the symphonies of Sergei Prokofiev with the State Academic Symphony Orchestra of Russia “Evgeny Svetlanov”. Other releases by Jurowski for PENTATONE include violin concertos by Britten and Hindemith with Arabella Steinbacher, and tone poems by Mahler and Strauss, performed with the Rundfunk-Sinfonieorchester Berlin where he is Chief Conductor and Artistic Director. Orchestra State Academic Symphony Orchestra of Russia "Evgeny Svetlanov"